If you're like me, you've always dreamed of being in that big captain's chair and shouting, "fire the torpedoes" or "more power to the shields", I have too, and that's why I built Quintet. I wanted to make a game were people worked together and communicated with each other. You'll notice a lot of the features are based around getting information from someone else. I've also been a fan of Star Trek since I was a kid and I've been going to conventions for a couple of decades. What platforms does Quintet work on? 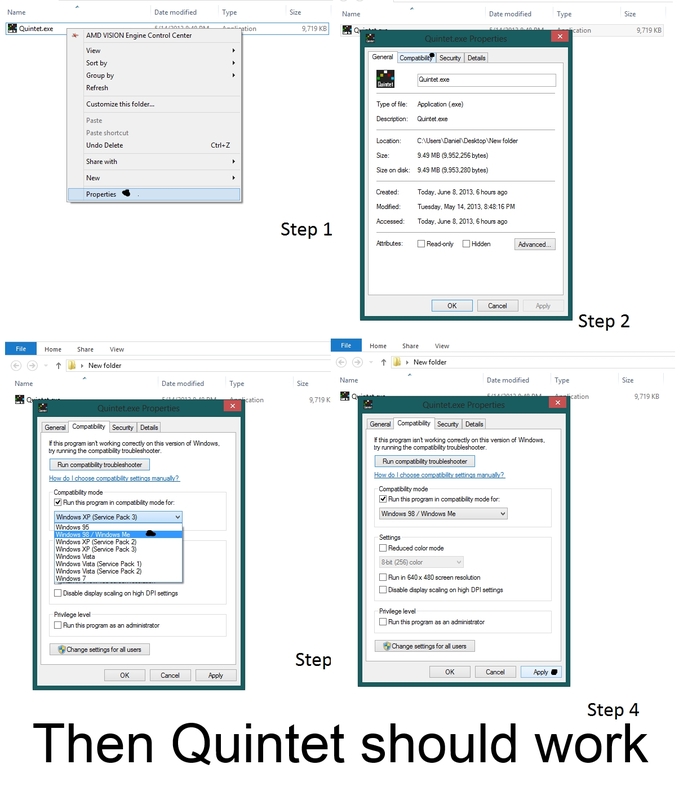 You can play Quintet on Mac, Windows, Linux, iOS and Android devices. All of these different devices can all be on the same ships too! Do I need 5 people to play? No. There are ships for 1, 2, 3, 4 and 5 players. All the different ships styles can play with or against each other. You can play for hours and hours and not have to pay anything. Some of the missions and features will require a $5 upgrade. The Trio ships, which were originally part of the Kickstarter are available for a $25 donation. Follow this link: Upgrade your account. I have an awesome idea! I found a bug/problem! Check out the forums for posting ideas and bugs and see what your fellow players have come up with also. It doesn't work on my Android device (or says not compatible). I personally use a Nexus 7 for testing the game, yet Google Play store says it's not compatible. If you're having a similar issue. Open the web browser on your device and click this link to download the .apk file. It should install on your device with out any issues. If Quintet will not load up on your device at all, visit the forum and report the issue. The User Interface is too small/big for my device. Go to the "Options" menu and then "Graphics" inside of Quintet. I've added scaling for the UI as well as adjusting for overscan issues. I'm getting a "get thread context failed" error. 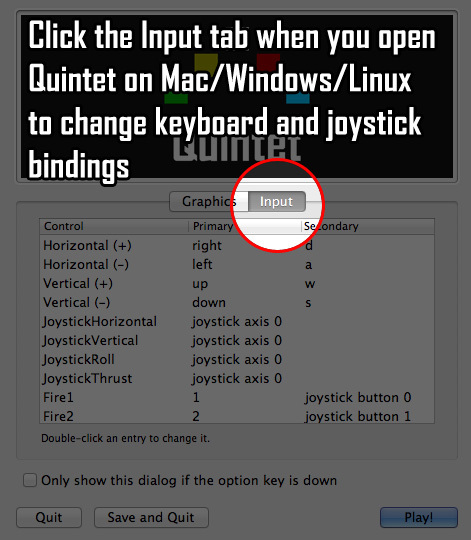 When you first load Quintet on Mac/Windows/Linux, the launcher gives you an option to change graphics and input settings. You may need to also go into "options" when inside the game and enable joystick support. You can also turn the onscreen joystick on and off. (for touch screen laptops/tablets). Quintet has 5 different races of ships you can choose from (plus an additional race of enemies). Each race has it's own strength and weaknesses. Humans (white) are the average. The Zurna (yellow) are built for speed. The Davul (red) have the best firepower. The Santoor (green) have the best engineering capabilities. The Udu (blue) specialize in science. Zurna and Davul are enemies, and Santoor and Udu are enemies. Humans are neutral. "Creeping" is when a ship may get within range and even scan another ship but not attack. Of course, every one is enemy of the Hive and the Hive is enemy of everyone. Always target your enemy first to make your shots count! Most weapons will fire towards an enemy or even follow/seek when they are locked on. What about if they are cloaked? You do not need a lock on to do damage to other ships. You can fire where you think they are and you will do the same amount of damage if you hit them. The beam laser fires instantly and does a small amount of damage. Your science officer can scan an enemy ship and provide you with it's shield frequency. Using the frequency, you can penetrate your enemy's shields and hit their hull directly. Additionally, you can target one of their systems (engines, shield generator or weapons). To slowly disable their ship. Torpedoes are projectile weapons that do a medium amount of damage. When locked, torpedoes will seek/follow targets. Larger ships are equipped with forward and aft (behind you) torpedo launchers. The large cannon does a high amount of damage. When locked, the large cannon will fire in the direction of a target (but not follow/seek them). Hits from large cannons can send ships tumbling. Blink is a quick instant teleport. Great for getting your ship into (or out of) range. Cloak makes your ship harder to see visually as well as impossible to target with weapons. Useful for getting some free shots off of your enemies. But be careful, invisible does not mean invincible. Generates small drones that fight for your ship with various abilities. Some have weapons, while others will jam other ships or even act as a cloaked mine. A rare weapon specifically designed to overload and destroy DATs. An area effect that turns off other ship's cloaks. An area effect that causes nearby ships to randomly lose some of their weapons, engines or shields temporarily. A ram in the front of your ship that does direct hull damage to other ships. Also provides defense against weapons. A shield that forms in front of your ship. It will stop any incoming weapons. A temporary impenetrable bubble around your entire ship. All weapons will instantly lock onto targets (no count down required). Modulate Shields If you've been scanned, modulate your shields to change your frequency. An area affect that boosts the engines of nearby friendly ships. An area affect that repairs the hull of nearby friendly ships. An area affect that boosts the weapons of nearby friendly ships. Similar to cloak where you can't be targeted, but more advanced to where you can not be affected by any weapons or abilities. An area affect that sends nearby ships tumbling (and away from you). Great for slamming ships into other obstacles. Used for hacking and boosting other ship's systems. The effects are temporary (but deadly). The scanner is used to get information about other ship's hull, shields and damage. Your beam laser can be calibrated to the frequency of your enemy shields and go right through them (to directly damage the ship). Used to drain or send shield energy to other ships. Great to use as a first strike on an enemy. A more powerful and boostable version of Blink. This will teleport your ship great distances. Useful for getting into or out of a fight. A simple panel for temporarily providing more power to one of your systems. Available on smaller ships. Used to push or pull other ships. A quirky ability with lots of interesting uses. Pushing ships into asteroids. Pulling an enemy out of a group to avoid fighting too many at one time. Distracting/confusing other players. For certain types of maps/games, you can warp to other areas. Once the Captain provides the coordinates from his console, you can activate the warp drive to go there. Stops your enemy's weapons from being able to lock on. You can make up your own scenarios with different map locations. Locations can run scripts to spawn ships, spacestations, etc. You can set your scenarios to public so anyone can play them. Go to your account to add/edit your custom scenarios. Your scenario needs at least 1 location. Each location can have different settings for the background, asteroids, objects that spawn when entered, race/color and more. Want the lights to dim when you cloak? Looking to turn on a DMX light when you fire weapons? Maybe set the room ambient lighting with Philips Hue lights? Want to send a tweet when you destroy your enemies? You can do all of this with the Quintet Event System (and some scripting). Some features (such as DMX lights) only work on Windows. If you want to control them from a tablet you can run the Event System software on a Windows machine (below) and simply put in the IP of the machine. If you've never heard of Philips HUE lights, visit meethue.com to find out more. If you've never used or heard of DMX, I absolutely recommending this YouTube Tutorial about DMX. It's really short and explains it really well. How do I make the Quintet Event System work with Philips HUE Lights? • You'll need the starter kit. You can buy from Amazon or from the Apple store. • Follow the instructions to get your bulbs setup and working with your iPhone or Android device. • Follow the instructions on the Philips Developer getting started page to setup the account to access your lights. Any device can communicate directly with the HUE lights. NOTE: Philips lights like to fade in and out and can't receive a lot of messages quickly. How do I make the Quintet Event System work with DMX Lights? • Install windows drivers from that page. • Get some DMX lights! I'm using the American Dj Supply Mega Bar 50RGB and the American Dj Mega Par Profile RGB Led Par Can. You will need to run the ctgEventServer on a windows machine to control the actual lights. Any device can communicate to the ctgEventServer and tell it to do things with the lights. NOTE: I've got mine set for 3 channel mode. Don't forget to install the driver. I've only tested this with the ENTTEC USB OPEN DMX. Scripts are in JSON format. Here is a sample below. There are all kinds of messages sent about ships. Here is the list. If you don't see something here that you need, let me know! You'll notice in the json sample there was a msg "w|f|0" the first character "w" is the system (weapons) the next is the action "fire" the number is which weapon this message was sent to. I use a cloud based network system called Photon (by ExitGames) for Quintet. That 3rd party company made a LAN version. They no longer support their LAN server, so unfortunately, I do not have Quintet working on LAN at this time. You can process events (weapons firing, shields, etc.) inside of Quintet, however the USB DMX only works on Windows machines (HUE works on every device). You can also use your Windows based machine to run the Event System scripts (outside of Quintet). Useful for when you want a centralized machine to run lights, play mp3s, and more. You can edit the "config.json" file, or make your own. Simply start the executable with -sc:\yourfile.txt to specify a different script name. Once it's running, you will need to go to options and event system inside Quintet, and put in the IP address of the Windows machine that is running the event server.